Pray, think of me from the domain of the mystery. In this life and all my lives to come. This precious birth, free and well-favored, is so difficult to obtain. May I not waste it but make good use of it. May I dispense with comfort and simplify my life. May I be able to keep to the workings of seed and result. May I develop the renunciation to leave samsara’s domain. May I and others find refuge in the Three Jewels and the Three Roots. For all six kinds of beings, my parents, infinite as the sky. May I practice single-mindedly and reach the peaks of experience and direct understanding. Look after me in all my lives to come. For my root guru, who is buddha in bodily form. Knowing that I am this mandala, may I stabilize its brilliant appearance. May I see them clearly, face to face. May the absorption of bliss-emptiness be stabilized in my mind. May confusion and clinging to ideas of reality be totally destroyed. And practice refinement, increase, emanation, transformation, and precision in perceiving specific objects. Dharmakaya, guru, yidam, sky-light, celestial realm, and others. May the three kayas be actualized in the intermediate state of existence. In this life may I know directly mahamudra, the nature of being. May I bring all experience into the spiritual path. May I master the path of generation and completion and travel to their celestial realm. May I know directly the fruit, no death, no deviation. And attain supreme mastery and mastery of the four awakened actions. May I dispel all the maladies and miseries of beings. Swell like rivers in the rainy season. May my power extend over the three realms and the three worlds. May my power and energy in wrathful mantras blaze like fire. We have committed, whether unwholesome in nature or because of commitment. By giving them wealth, Dharma, and security. Of the vows of individual liberation, awakening being, and the vajrayana commitments. The chopping of my body into ten million pieces for aeons. May I make the same enthusiastic effort as Sakyamuni Buddha. In dharmakaya, the pure being of mind, sheer clarity without limit. Of all experience in samsara and nirvana. Be it sutra or tantra of the New School or Old. Power and wealth, a heart of love, and be attractive to all who see me. For the Victorious One’s Doctrine and particularly for the Shangpa transmission. With rainbows and relics appearing, may I be a guide for beings. In the Realm of Bliss in the presence of Khyungpo and his sons. And then attain supreme complete enlightenment. May I be as helpful to all beings as the victorious ones and their sons. Be born as my first circle of students. And the direct path of Vajrayana on all who are to be tamed. Each and every sentient being in buddhahood. May there be no hindrances to the Dharma for us for a single moment. May they always be happy and joyful. Come into me; may I experience the pain. Never again experience any misery, evil, or confusion. May all the wishes which I have expressed be quickly fulfilled. To all my mothers who are as limitless as space. And together attain full awakening. 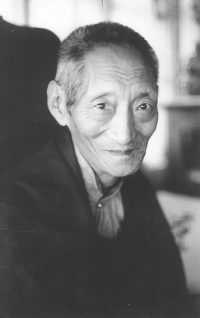 This prayer was composed in the Male Earth Dragon Year (1928) by Karma Rangjung Kunchab (Kalu Rinpoche) who is in the lowest position in the line of transmission of the Glorious Shangpa Tradition.May this prayer be of great benefit to beings.MANGALAMThis prayer was translated by Ken McLeod in 1985 for Kalu Rinpoche’s autobiography.